What happened….just a month ago I was home nearly all the time! I slept in this morning – alarm had been turned right down somehow so didn’t hear it! Corey has decided that 5am is playtime – ummm NO WAY KID! So get the kids ready in a flurry of yelling “NOW” – I hate myself when I’m yelling at them must find a better way to get them ready in a hurry – think i might buy a kitchen timer and see if we can race it to get dressed in the morning ready for kinder! Brett wanted to sit in the toddler seat so we walked fast and having left 5min late actually got there early lol! Thats one way to improve my fitness level! top50 forum is back online today YAY!!! gallery still down though BOOO! hopefully hosting shop will have it fixed shortly! Have a meeting this afternoon with early intervention and kinder teacher so thats good. His toilet training has backslid big time since my week long gall stone attack! House valuation is on Thursday afternoon so I guess I have to do some tidying before then but he seems to think that it won’t be an issue at all as we only need it to be $140ish and he says you can’t buy anything for that (did mention ours is a fixer upperer) lol! So should be ok and then hopefully can be signing paperwork shortly and getting on with life in general! In the meantime I think I’ve neglected to mention of late my Bretty boy – he has grown up soooo much in the last few months. He’s a regular little chatterbox (yes just like mummy) once he gets started and he is full of cuddles and kisses – although he is also learning to throw a tanty! oh well can’t have it all! It is awesome to see though that he isnt’ going to have the language problems that Owen had/has. anyway more later better get organised or will be late for aforementioned meeting! I think the most important – and equally the most difficult – one is to find a balance between work, rest and play! I find some days that I feel the need to ‘play’ to have a little time for me and when I try to get it my little ones interrupt, I tend to growl and try to shoo them away and it doesn’t work and I get more and more frustrated because all I want is 5 minutes to myself. Well on good days I see my kids come in and while I still am a bit frustrated as I want some time alone, I spend some time with them instead – and often they only want 15min of my time and then I’m able to get 15min to myself….a little delayed but hey in the end this way we all get what we need. I’m working on it. A time for housework, a time for computer work & play, a time for my kids, who after all are the lights of my life! ANd when they are in bed well then there is plenty of time for me while still getting to bed in time for enough rest to face the day again. So its almost 11.30, I’ve talked to the boys on the way to kinder and to brett on the way home, I’ve caught up on morning emails/website stuff and I’ve cooked dinner for later. 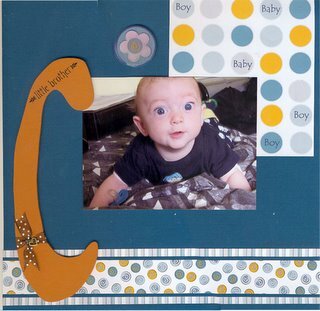 Soon I’m off to give Brett a swing and maybe read a story before we head back out to pick Owen up from kinder. Then lunch and play and folding some washing and maybe some more stories as the boys are just loving them at the moment and I really love to encourage them to read. We are having more and more TV OFF time too which I love! honestly 3 boys make more than enough noise without the tele on too! I certainly hope that there is indeed a quiet place in heaven for the mothers of boys! Monday morning loomed way too fast. Corey had a rather bad night so I was NOT happy about being awake…but life goes on and kids don’t get themselves dressed, fed and off to kindergarten on their own. So I got up and showered and dressed, I dressed Owen and Brett and got them breakfast and got Owen’s kinder lunchbox/drinkbottle sorted out. Hubby came out with corey a bit grumpy that I was letting him cry….apparently he didn’t notice that he had kept me awake most of the night…oh well got him organised and thought a walk in the pram might settle him a bit – which it did yay! There is roadworks on the way to kinder right next to the school crossing and it’s terrible , hopefully they will finish soon as it is a bugger to negotiate with the pram. At the same time the kids are getting to see how to ‘fix a road’ a bit and they are facinated with the machinery involved (and they are pretty damn good at holding onto the pram so i’m not stressed about them running off)! It was the last day for kinder t-shirt/jumper orders so hopefully we will get them soon as I know he will love them (cause i ordered them both in RED). I’m still being told at least 15 times a day that ‘red is my favourite colour, i like red’…cute if wearing a little thin! Oh well nothing much else exciting happened except a trip to the dentist….no a trip to the dentist isn’t exciting, in fact I hate going as much as anyone BUT gettingback into the car and looking in the rear view mirror to see all my bottom teeth in tact and cleaned was well worth an hour or so in the chair….going back next monday for some work on the top ones….smile restorations are almost complete YAY – will have to take a pic of my new smile once it is finished! another Sunday has rolled on by. I was up early as per usual – if I don’t get up kids make a huge mess and they are loud enough that there is no hope of sleep anyway. I have miraculously been much better at tearing myself out of bed in the morning for them though. So I took Owen with me for my run to the supermarket for whatever we had run out of – I didn’t really shop this week at all so we were out of laundry powder and bread, got some crumpets too – yum i love crumpets…speaking of which don’t you love the way these days crumpet packets say 99% fat free (or is it 97? anyway) yeah right i’m thinking – they are until i SLATHER them in butter! Got the extra paperwork the credit union wanted for the mortgage refinancing faxed so hopeful of a preliminary answer as early as tomorrow (will be pending a valuation) but that is one step closer to my new (2nd hand) people mover yay! I’m a bit excited about the prospect of actaully owning a car in my own name for the first time EVER! I got some scrapping done last night too when a friend came over to scrap. Was good to be scrapping again even if one layout took me forever. Hopefully some of the girls will make it next weekend – I’m planning to get some pics printed out through the week so that I can be ready to go for friday and saturday night. well Brett has shown a bit of an interest and after all the dramas with Owen (who is still regularly having accidents) I really didn’t want to push – encourage but not push….well today was pretty worm – low/mid thirties so he was playing naked because HE wanted his nappy off! He has learnt to climb up on the toilet himself – if somewhat slowly – lol but he is VERY excited about the whole thing and went a few times today. I did catch him starting to go once when i was feeding Corey but told him to do wee’s in the toilet….and he DID! woohooo! Still a long way to go but definetly making some quite good progress there! thats about it for today – except to recount a funny story. Owen told me the other day – after I had been yelling at him for being naughty, that mummy was sad. I told him yes Mummy gets sad when Owen and Brett are naughty boys…so today he runs in and says ‘i do wees on the toilet – i make mummy happy’ – very sweet…then brett says ‘i make mummy happy tooo, i do wees on the toilet’ and so yet another sappy reminder that even though my boys may unroll a brand new roll of toilet paper, empty 4 boxes of sultanas on the floor, get ice and leave the freezer open and generally be quite naughty a lot…………they also light up my life with a few sweet words and a smile………..and Corey – even though he threw up ON MY FACE this evening (ugh) he did it with the hugest big baby smile that I just couldn’t be annoyed (although I DID shower)! I spent the entire day at Lost in Time annoying Sue today lol! I went on the pretence of repping the new AED Bubs n buds range (yum go check it out) and showing her some stuff online etc but you know I did maybe 30min of what I intended to do and managed to spend the rest of the day just nattering! (next time will take my scrap stuff and play) in fact I think I might actually head over one day JUST to play for the HELL OF IT! It was fun and I think I needed some time out with all the crap going on lately. paperwork faxed to credit union minus a couple of things we coudln’t find hoping it will be sufficient anyway guess I’ll find out tomorrow! Results of scan show no stones where they shouldn’t be so got the green light for surgery – yay – umm I think lol! Now just have to wait for a date from the hospital – apparently I’m on the urgent list but don’t know how long that is ?! isn’t it funny how when you make a major decision in life things change even while they stay the same…sometimes just making the decision (even before you act on it necessarily) makes everything seem easier and lifts a weight you didn’t know was there….like nothing has changed except for your perspective on life and yet at the same time…everything has changed….I don’t know if I am making any sense at all today so if you have no clue then just pretend you didn’t read this bit rofl! Just a boy & his teddy ….or so it seems…. Well in all the cleaning and moving Owen today found this teddy. Mummy’s teddy. Yes that’s right he found my teddy, the teddy that Santa brought me when I was 4 (incidently the same age Owen is now). I told him that teddy’s name was John and that he was old so he’d have to play carefully……..then he came running in to tell me that John was having a swing! Ok so this may seem like nothing special but to me it is just amazing. 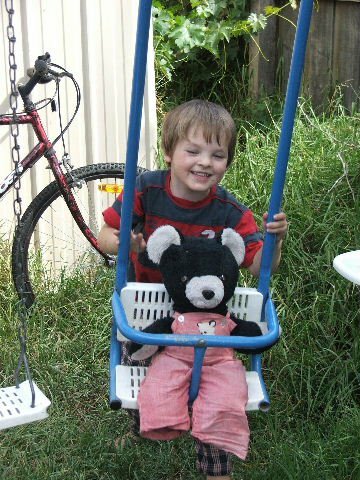 Amazing that my teddy can still bring joy to a 4yr old….amazing that somewhere there may well exist a very similar picture to this one but with me in it instead of Owen…amazing that John is still in one piece (well thanks to mum sewing back together a few times I guess). You see I remember playing with John, we did lots of things together when I was younger. Also amazing that my boy is displaying such an awesome imagination! And an update on my day….I slept in the master bedroom last night at last! I had my mrcp scan this morning. No one had thought to tell me that it involved a hospital surgical type gown – well the paperwork with details arrived in the post when I got home – so….there I was being asked to strip down and put a gown on – only leaving my underpants oh Yay!….so there I am reading the cars guide (because i’m hoping to buy a new 2nd hand car soon) and i’m thinking that had I known about the whole gown thing I would have shaved my legs and put on nicer knickers lol! oh well all done just waiting for results…..
and now trying to find a pile of paperwork to fax to credit union for mortgage refinancing (and extra for my new 2nd hand people mover).